Home Tags Posts tagged with "london marathon"
London Marathon runners wore black ribbons on their vests in honor of Monday’s Boston Marathon bombings victims. Thousands lined the streets to see the 36,000 runners set off from Blackheath, where a 30-second silence was held. Three people were killed and more than 170 others injured by the Boston Marathon’s twin blasts at the finish line. Hundreds of extra police officers were drafted in as reassurance in London. About half a million people were expected to watch the race, although official estimates have yet to be made. Just before the start of the main race, event commentator Geoff Wightman introduced the half-minute silence. “Marathon running is a global sport,” he said. Geoff Wightman said the marathon family had been “shocked and saddened” by the events in Boston and the silence was to show “our respect and support for the victims”. A senior US diplomat based in the UK said the commemoration underlined the “special relationship” between the two countries. Barbara Stephenson, Charge d’Affaires at the US Embassy, told Sky News: “We’ve had responses from Her Majesty the Queen, all through Twitter from the British people, and now we have got tens of thousands of London Marathon runners wearing a black ribbon in solidarity with the people of Boston. London Marathon appears to have passed off without incident. Race director Hugh Brasher said before the race that a full security review had taken place and everyone had been adamant that the “show must go on”. The Metropolitan Police in London said it had reviewed security plans after the Boston attacks and that the extra officers would be used for “for reassurance patrols”. Australia’s Kurt Fearnley was the first athlete to cross the line, winning the men’s wheelchair race. Tatyana McFadden won the women’s wheelchair race less than a week after winning the equivalent race in Boston. In the women’s elite race, there was controversy early on when 2010 wheelchair winner Josh Cassidy dropped out after a collision with Olympic champion runner Tiki Gelana. She continued running but was off the pace and her race was won by Kenyan Priscah Jeptoo in a time of 2:20:15. The men’s race was won by Ethiopia’s Tsegaye Kebede and the men’s race by Ethiopian Tsegaye Kebede, who overtook 2011 champion Emmanuel Mutai in the closing stages. Mo Farah, who won the 5,000m and 10,000m at the 2012 London Olympics, ran only the first half of the 26.2-mile course. Afterwards he praised the atmosphere of the crowd and said the experience was good practice ahead of him running the full race next year. Singer Katherine Jenkins, cricketer Andrew Strauss and McFly’s Harry Judd were among the well-known names running. Prince Harry, who is the patron of the London Marathon Charitable Trust, gave the winners their medals. He said it was “never an option” that he would not be at the race because of security fears following the Boston bombings. “The great thing about the marathon is no matter what color you are, or religion, no matter what nationality you are, everyone comes together to run a certain distance to raise money for amazing causes. Meanwhile, specialist US terrorism officers are waiting to question Dzhokhar Tsarnaev, the surviving suspect in the twin bombings close to the finish line of the Boston Marathon. Dzhokhar Tsarnaev’s older brother, Tamerlan, died after a shoot-out with police. 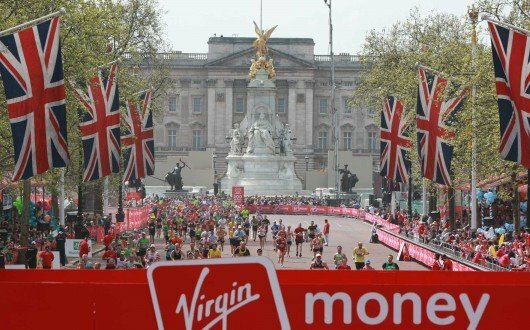 Virgin London Marathon has pledged to donate £2 ($3) for every runner that finishes Sunday’s event to The One Fund Boston set up to raise money for victims of the explosions. 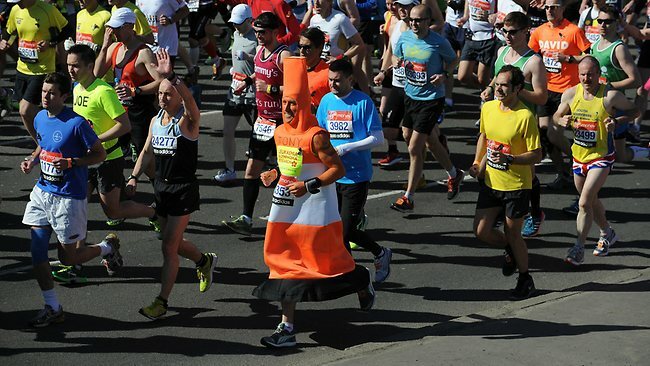 London Marathon 2013, one of the biggest participation sport events in the UK, takes place on Sunday, April 21. The race will feature in excess of 36,000 runners as they make the 26-mile, 385 yard journey from Blackheath to The Mall. The name “marathon” comes from the name of a Greek battlefield, from which messenger Pheidippides ran the 24.8 miles to Athens to announce the Greeks’ victory over the Persians. After delivering his message, he collapsed and died from exhaustion. The 2011 winner, Kenya’s Emmanuel Mutai, completed the London Marathon in a new course record of 2:02.40. Lloyd Scott competed in London Marathon 2002 wearing a 110 lb deep-sea diving suit. It took him five days and eight hours to complete the course, breaking the world record for the slowest marathon time. It’s a record that will remain unbroken, as London Marathon officials have set a maximum time limit of 24 hours. Lloyd Scott has also completed the course dressed as a snail, St George and Indiana Jones. The blue paint that marks out the course is steam-cleaned off as the last runner passes so the streets of London are returned to their pristine condition without delay. Journalist and former conservative politician Matthew Parris holds the record for the fastest MP to complete the London Marathon. He nailed the 26 miles in 2 hours and 32 minutes in 1985. In 2011 football freestyler John Farnworth completed the course in 12 hours 15 minutes, juggling a football for the entire distance. He didn’t drop the ball once. 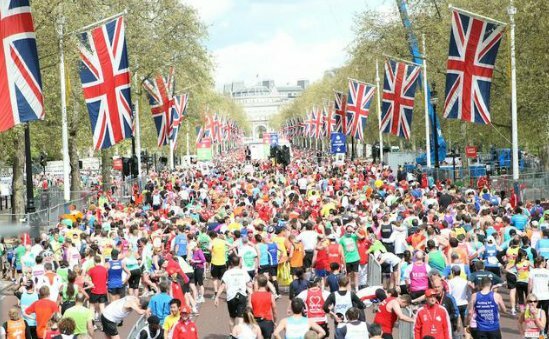 Notable celebrities who have run the marathon include Richard Dunwoody, Gordon Ramsay, Sir Ranulph Fiennes, Graham Taylor, Jeffrey Archer, Lorraine Kelly, Nell McAndrew and Sophie Anderton. In 2005 Paula Radcliffe was caught short and had to relieve herself mid-race. Marathon runners travel further than the longest bus route in London – the X26 from Croydon to Heathrow – which is 23.75 miles long. The London Marathon was the first to be run over 26.2 miles as during the 1908 Olympics the Royal Box lay 385 yards beyond the 26 mile finish line. The race was therefore extended so the finish was beneath the Royal Box. The marathon has kept its extra 0.2 of a mile ever since.